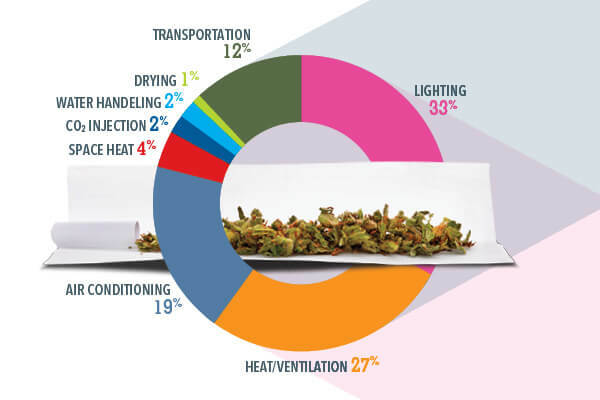 Takeaway: Ever wonder what the ecological cost of a joint is? Ian Ashdown, Maximum Yield advisory board member and senior scientist at SunTracker Technologies, did. After referencing several studies, he came up with the answer and a way to put it into context. It was a very pleasant lunch conversation in Victoria, B.C. with Lisa Jansen van Rensburg of P.L. Lights, colleague Wallace Scott of SunTracker Technologies, and Maximum Yield Cannabis editor Toby Gorman that spurred the question: How much energy does it take to produce a single joint of cannabis? Surprisingly, the answer was not all that difficult to determine. The author also estimated that one kilogram of final product requires between 5,200 and 6,500 kilowatt hours (kWh) of electricity (or, an average of 5,850 kWh). Bayesian Inference for the Distribution of Grams of Marijuana in a Joint, (Ridgeway, G., and B. Kilmer, 2016), where the authors calculated 0.32 grams per joint (which is less than previous estimates of 0.43 to 0.75 grams). With this, the answer is: A typical cannabis joint has a carbon footprint of 1.4 kilograms of CO2 and requires enough electricity to power a 60-watt equivalent LED lamp for 200 hours. To put the CO2 issue into perspective, an average sedentary person generates about one kilogram of CO2 a day just by breathing. We can provide a reference in another way. According to the US Environmental Protection Agency, the average passenger vehicle emits 404 grams of CO2 per mile. So, if one average kilogram of final product is associated with 4,600 kilograms of CO2 emissions to the atmosphere, and if the average joint is considered to weigh 0.32 grams, then: (0.32 grams marijuana/ joint) x (4,600,000 grams CO2 /1,000 grams marijuana) x (1 mile/404 grams CO2) = (3.64 miles/joint) x (1.609 kilometers/mile) = 5.86 kilometers/joint. The average passenger vehicle traveling 5.86 kilometers (3.64 miles) emits the same amount of CO2 as it takes to produce an average joint.